Under the normal run of things, a kid-centric animated feature based on a toy-line and released in October (even in time for the UK half-term break) would scream of a movie being dumped out by its distributor into the graveyard slot. But a full-length Lego movie is not the normal run of things (yet, anyway). 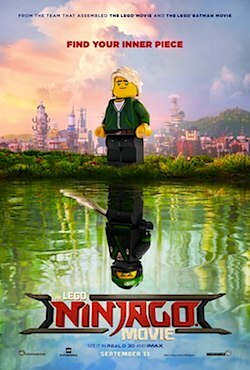 Before I start picking it apart (or moaning), I should say that I did enjoy The Lego Ninjago Movie. From a marketing point of view, Christmas is just around the corner and this is a two hour advertisement which potential customers will literally pay to watch - genius. More importantly, it's frequently both fun and funny, which is always good. A young boy wanders into an oriental curiosity-shop. There he talks with the mysteriously quirky owner Mr Liu (Jackie Chan), who tells him the tale of trainee ninja Lloyd (voiced by Dave Franco) and his journey to find himself while balancing the demands of his school-life, his sensei Master Wu (also voiced by Jackie Chan), a protective mother Koko (voiced by Olivia Munn), and constant battles with his evil overlord father Garmadon (voiced by Justin Theroux). There are laughs, there are thrills and there are countless digitally-rendered plastic bricks. And it's all over the place, frankly. I imagine more than one employee at Warner Animation had The Law Of Diminishing Returns bookmarked, as they tried to gently suggest that the core demographic for The Ninjago Movie is far smaller than The Lego Group would care to admit*1. 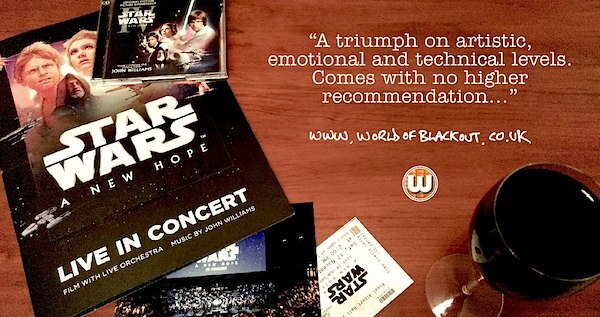 Their 2014 flagship entry had cross-brand appeal for both young audiences (ie product targets) and their nostalgia-generation parents (ie actual customers). Similarly, the Batman spin-off from earlier this year had appeal to the kids and to long-term Batman fans of all ages. 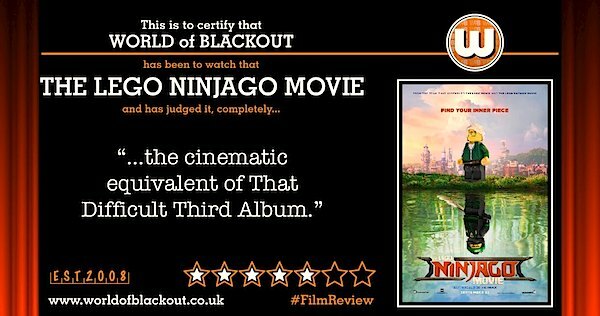 Ninjago is very limited by comparison, an in-house property which casual audiences are only faintly aware of, if at all. And there's nothing wrong with that per se, but this doesn't interact with the previous outings so has its own foundations to lay, and all that world-building takes a delicate hand*2. Everything looks as pixel-perfect as you'd expect here, with Dave Franco and Justin Theroux leading an accomplished voice-cast, well-matched to their characters. The problem is more in the writing. For a Lego-branded movie, there's a distinct lack of focus on imagination and creative building. Everything is made out of the Danish bricks we all know and love, but that seems like a coincidence rather than a raison d'être*3. This is what happens when your movie has three directors, six screenwriters and a further three story writers. I wish I was exaggerating about that. Stretches are incredibly witty, stretches are fun and exciting, then some are... well, okay I guess. Never bad, but far more perfunctory than you'd expect for something with this much money behind it. The main father/son storyline really seems to be rehashing themes from The Lego Movie (but with Theroux told to sound a bit like Will Arnett's Batman for good measure). And with our evil villain's base located in a volcano, the screenplay sets up perfect opportunities for some James Bond (or even Austin Powers) riffs, then completely fails to deliver any. Similarly, there's a textbook Temple of Doom setup which everyone seems to have chickened out of seeing through. Instead, the story treads between brick-splitting chase sequences and domestic wise-assing between the Ninjago crew and Garmadon's gang. Both are largely fine, but both are variable within that scope*4. And eager to convince the purchasers of tickets that their money hasn't just been spent on a toy advert, the close of Act III brings a mortifyingly sentimental ending that the film just hasn't earned. In all honesty, both ends of the live-action framing device had be grinning more warmly than anything in the main stretch. Mainly the Lego and Batman movies, but there's also an unavoidable dash of Power Rangers in here, too. As beautiful as this is to look at, it's distinctly Straight-to-Video in spirit. Be an expensive but probably successful marketing exercise? Undoubtedly. There are seven of them. In a row. Level 1: No voice-cast links to mention, but Jill Wilfert is a producer on this movie, as well as being Executive Producer on the The Padawan Menace, The Empire Strikes Out, Droid Tales and The Freemaker Adventures. There might also be someone from The Last Jedi in this, but that's unconfirmed at this point.